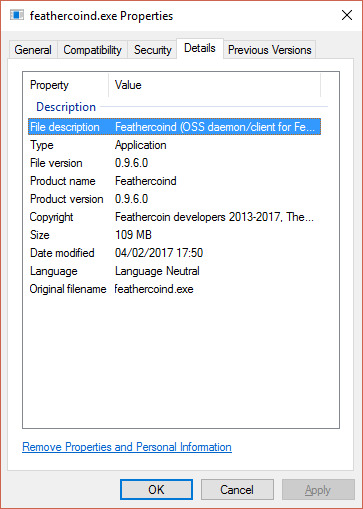 [Dev] Feathercoin 0.9.6.2 * Maintenance fix, build & upgrade issues notes. Task : Re factor all changes from 0.9.6.0 to 0.9.6.1 into version 0.11. UI updates, new icons splash screen, tests, colour scheme etc. 0.9.6.2 is the new maintenance version for 0.9.x series.although there are no fork issues, so it could be used to release an emergency fix version if necessary. Chinese Language files need update. Not sure where to log this, maybe github. Github issue created. When I get some time I’m gonna go and change it, I can test with my windows build environment. That definition is used only, if there is no bitcoin-config.h, which in turn is created/updated by the autoconfig scripr, so the definitions in src\clientversion.h are never used. I think Lizhi might be right. Also we have a slight problem. Look at the version, it’s wrong. and matches what Lizhi was saying. Now the right version and copyright date appear. Good find @lizhi !! will it need to be changed in the .rc files as well? according to the piece of code you copied it should be ok.
@Wellenreiter and I have been working on the sendAlert call which is used to send alerts across the Feathercoin Network. I Believe we’ve solved this. Wellenreiter was able to send an alert over the TestNet and he received it on his node. There was an issue with one of the blocks on the testnet so that’s just being fixed…one that’s done I should hopefully be able to connect to the TestNet Node Wellenreiter set up and receive his test message. Then we can apply the same patch to prod. Just a note to double check FTC code for this issue LTC #293 - List of FTC custom settings? But Litecoin is 4x faster then Bitcoin. @Wellenreiter has started to lock down the code for the release of version 0.9.6.1. Reviewed outstanding document updates and policy. 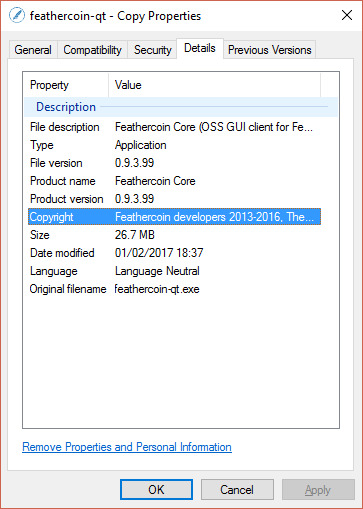 The FTC software settings, naming conventions and software development fork procedure showed that a lot of work is need to up keep Feathercoin name interface changes. Some changes such as comments, or where Feathercoin operates the same as Bitcoin core are unnecessary. How to handle files in the future for cherry pick or updates from head were discussed. Review - update Wallet guide, MultiSig is an important, but complex update, needs better screen shots / help text. Note : 0.9.6.1 will be a long term version, compatible as a wallet with 0.11. The most usefull cases for Multisig, once you have got over the learning curve, is for more names, and say 3 out of 5, so there is redundancy for fund handling or other open source management / DAO criteria. Feathercoin has spent considerable bounties to include shapeshift, for over one year. We understood FTC was to be reinstated after you had some problems. The next release is to be finalised within 5 days and it will then be about 6 months before it can be reinstated. Hello from the ShapeShift.io Support Team! Your request (64102) has been received and is being reviewed by our team. Please, only send in one ticket per issue - this is important to speed up your resolution time. To ensure you get the best support possible please be sure you have included the ShapeShift deposit address and the TXID (or Hash) of your deposit(s). ShapeShift Support is available 7 days a week from 11am-7pm EST. Support is available, but limited outside of those hours. Your request will be resolved within 3-4 days. I also sent SHapeShift an email a few weeks ago about adding Feathercoin back. I didnt get a direct response yet. In at least one place (in main.cpp) - FTC custom settings are required because of block time and reward scaling of Bitcoin parameters. Further, whilst reviewing an emergency change, comparison should be made with the Litecoin setting, to ensure the further scaling of coin reward is reflected in the minimum fees. This is very important as it is currently mode of failure of Bitcoin and we will be stuck with high fees till the next release.